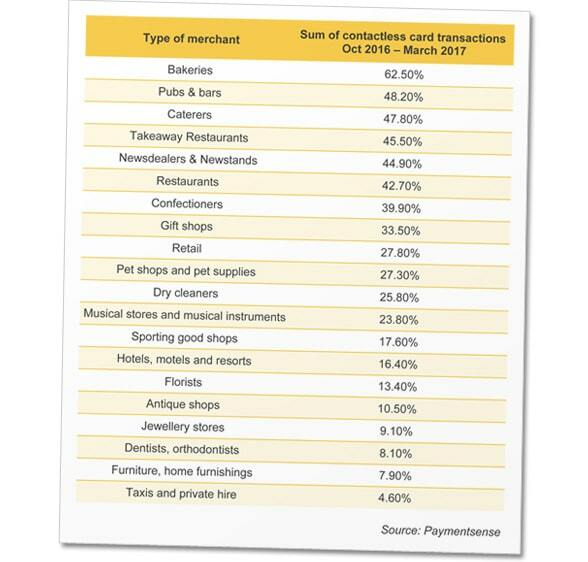 The highest percentage of contactless payments across the UK are taking place in bakeries (62.5%) followed by pubs and bars (48.2%), caterers (47.8%), takeaway restaurants (45.5%), news dealers and newsstands (44.9%) and restaurants with 42.7%, research released by merchant services provider Paymentsense reveals. The findings — which reveal the top 20 locations for contactless payments in the UK — show that taxis and private hire are witnessing the smallest percentage of contactless payments with 4.6%, below furniture and home furnishing stores with 7.9% and dentists and orthodontists with 8.1%. “This was calculated by utilising the comprehensive pool of customer data, which records the amount of transactions their merchants have accepted by card and how many by contactless payments,” Paymentsense says. “The results were convincing — across the board, merchants had seen their contactless sales increase more than their chip & PIN transactions. Not having to dig in my pockets for cash or credit cards while crammed into the backseat of an American sedan/taxi is on of the best parts of using Apple Pay. In the US, greatest uses for contactless are probably (based on personal observation) what we call “fast food” followed by grocery stores. These are the merchants that have opted in. The motivation is transaction speed and convenience. Of course, most of our contactless payments are mobile because our thousands of issuers are not issuing contactless cards.